The upstairs bathroom served as the main bath for the house when we first moved into our home. 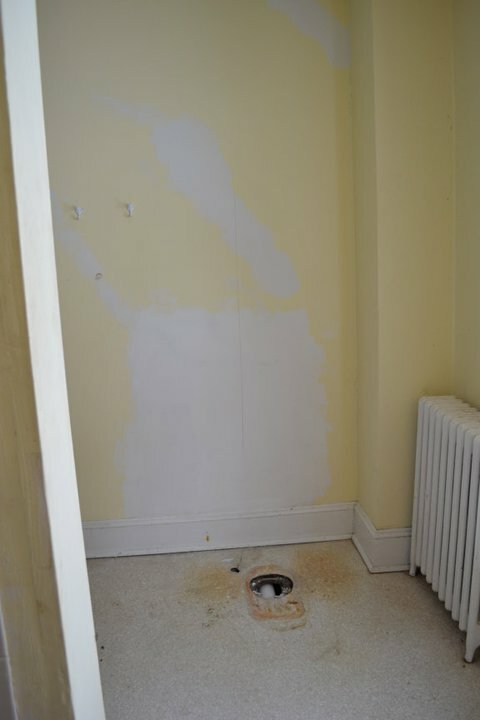 The inefficient layout housed a 1950’s cast iron tub and a toilet that was caving in the floor below. On one side of the tub stood a half wall for the tub’s plumbing and hand held shower. Within a few weeks after settlement, my younger brother took pity on us and built up the wall around the tub and added plumbing for a stand up shower. My husband turned an oddly placed outlet on the wall into a wall sconce. 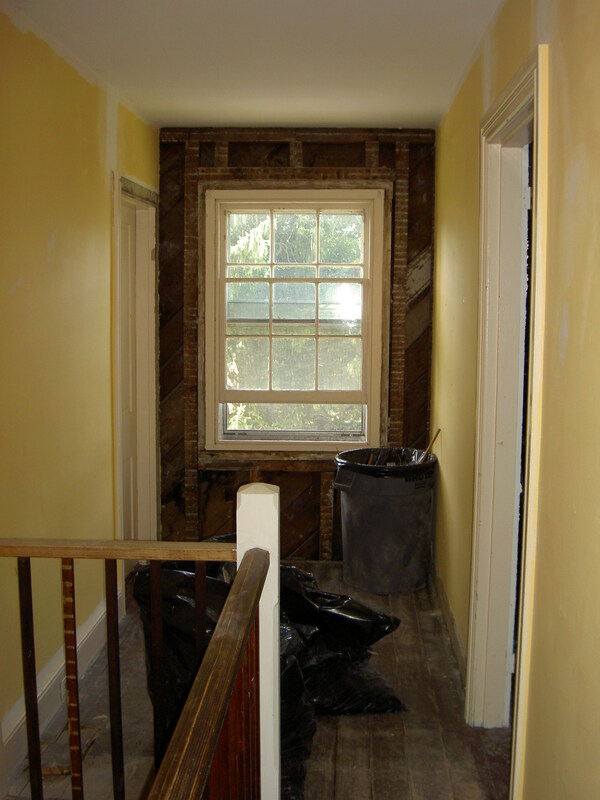 Fast forward to our first floor renovations–as the kitchen was fully demo’d, we discussed the 2nd floor bath layout with our contractor. 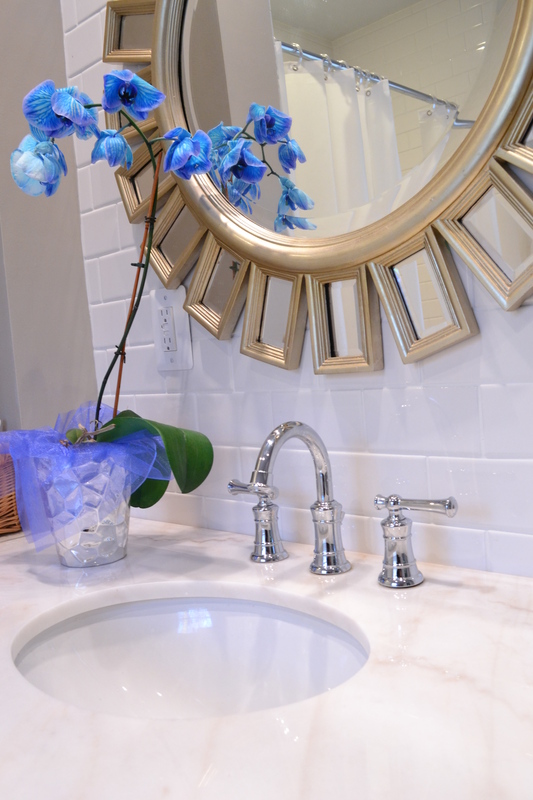 On paper, we made changes to the bath entry and the locations of the vanity, toilet and shower. The plumber ran new drainage pipes and water lines to accommodate the updated bath layout while the ceiling below was open. 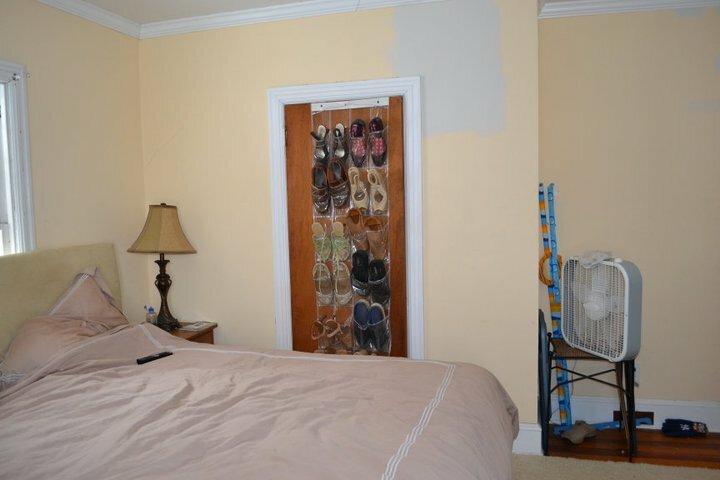 The bedroom view from entrance partially obscured on right by closet wall. 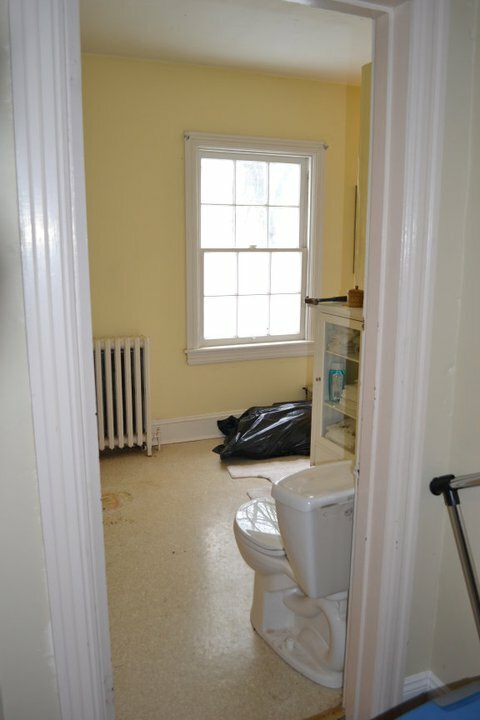 Toilet in the doorway. Fun! 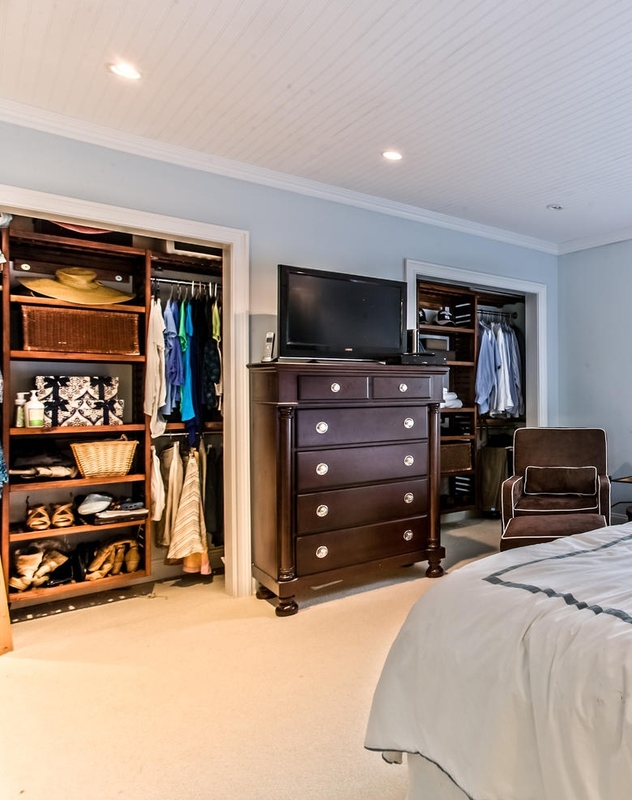 Bedroom with old, narrow closet. Future site of new bath entrance. 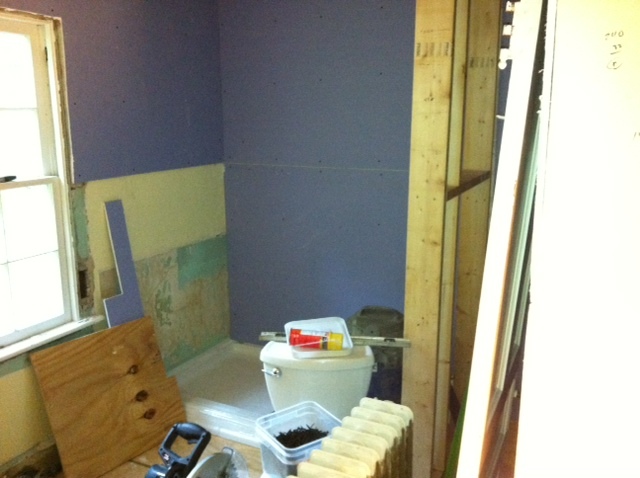 Old closet removed, new entrance to bath added. Narrow bedroom entrance. 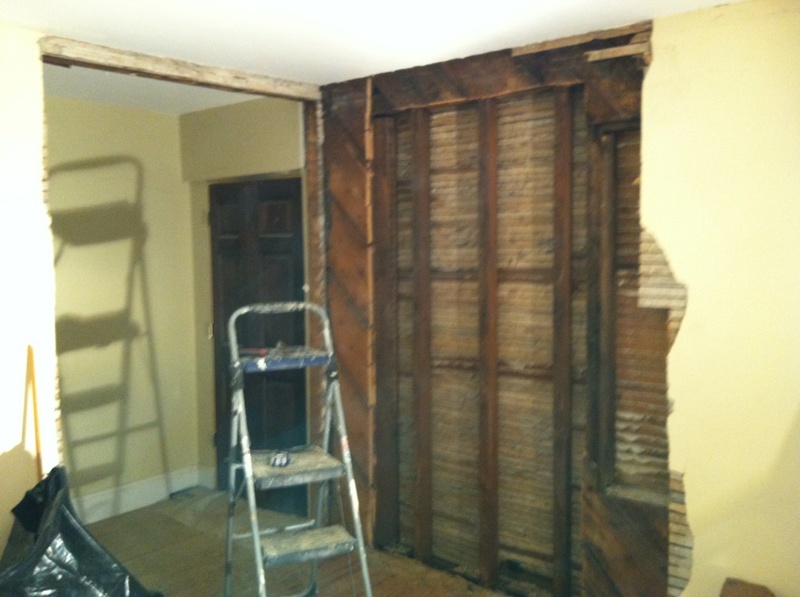 G and I had to remove a narrow closet in the bedroom to accommodate the new bath entrance (see above). 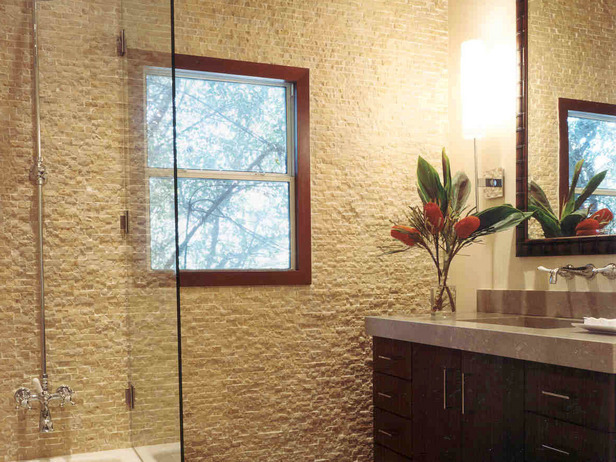 When we created a new hall bath a few years before, we built a new hallway wall. This left a few feet between the new hallway wall and the now master bedroom wall. G and I decided to add a closet on each side of the wall. 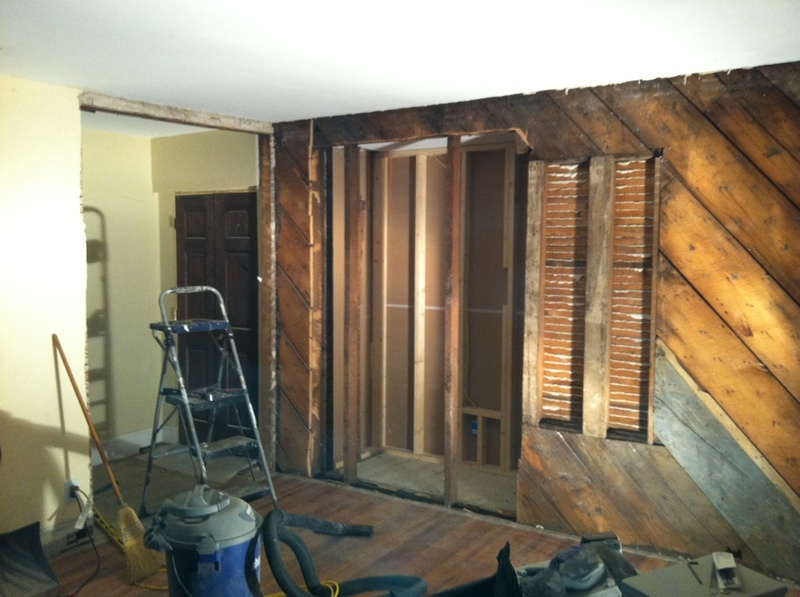 This would give us his and her closets and still have enough room for a chest of drawers in between to house the beloved television (see pics below of closet demo). Doorway added for new closet. New plywood sub flooring in bath. I searched craigslist and found a guy who stored small lots of tile in the back of an old warehouse. 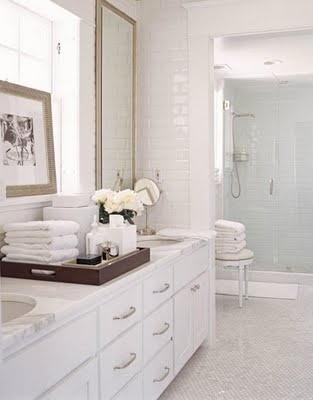 He said he had enough 12 x 12 white marble tiles to do our bathroom. His warehouse was located on the border of PA and N. Jersey on the ‘other side of the tracks’. We decided to check out his inventory on the way home from spending the holiday with Gs family. On New Years Eve, my husband and I took the exit off the main route and made our way through a forgotten town on the west side of the river . After making a few turns through worn neighborhoods on potholed roads, we pulled into an industrial area and parked in front of an old brick warehouse. I remember thinking it was a good idea to call mom to tell her we were taking a look at some marble and we would call her when we were finished. How do you tell your mom “if you don’t hear from us in 30 minutes, call the police” without worrying her? I jumped out and knocked on the door of the unmarked warehouse. About a minute later, the man I spoke to on the phone unlocked the door for me. With my cell phone on speed dial in my hand, I followed him to the back of the bone-chilling, dark building. He made small talk as he began turning on the overhead lights, and as the far lights lit up the back of the warehouse, I saw massive amounts of eye candy. There before me stood two dozen crates of various sized tiles all in perfect condition. I found white with various veining, grays, tans, and even found some amazing “couture” wall tiles. Tiles that sold for over $50 a square foot were stacked here for as little as $5. I asked if I could get my husband, and the nice man agreed. I ran to the door full speed as if I had just won the lottery. Months of research looking for something beautiful for around $3 a square foot finally paid off! 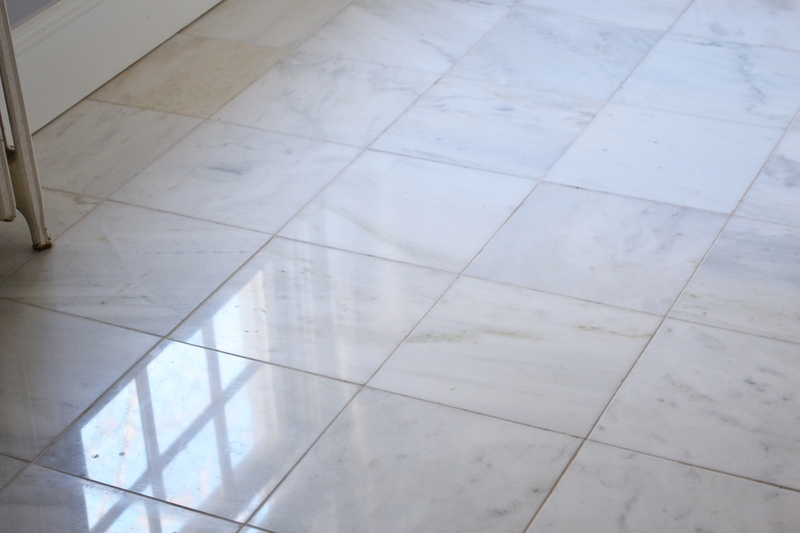 I couldn’t wait to show G.
Back inside we found beautiful white 12 x12 polished marble in a lot marked 150 feet. We asked the price and he gave it to us for $1 a square foot!!! I could not believe it. Prior to this, all of my shopping found similar marble at $10 a square foot. We told him we would take this lot, and he disappeared. He came back on a forklift and picked up our crate and carried it to the garage area. G backed our SUV packed with two toddlers, our dog, all of our gear and holiday presents toward the door. We knew it would be tight, but how could we resist a great deal? As we loaded up the car, it was clear the dog would have to sit straight up for the two hour ride home. Tiles were under all of our feet and stacked up tight behind our pooch. We said our goodbyes and made our way home with our loot. Sarah R.’s sparkly master piece. Love all the white with chrome. 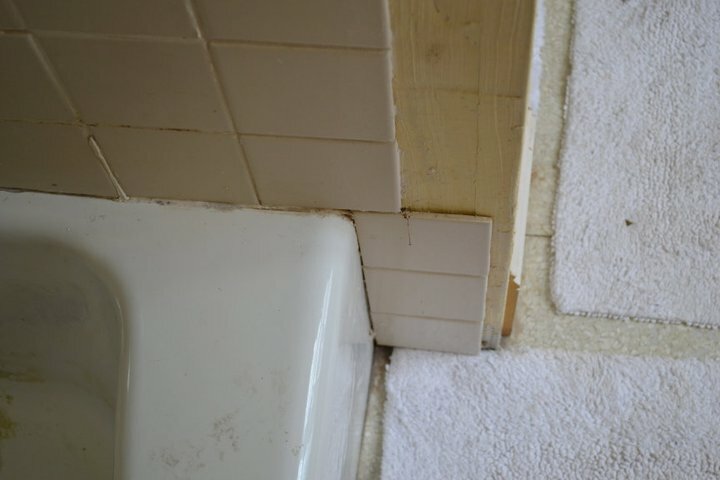 Inexpensive subway tile on wall. 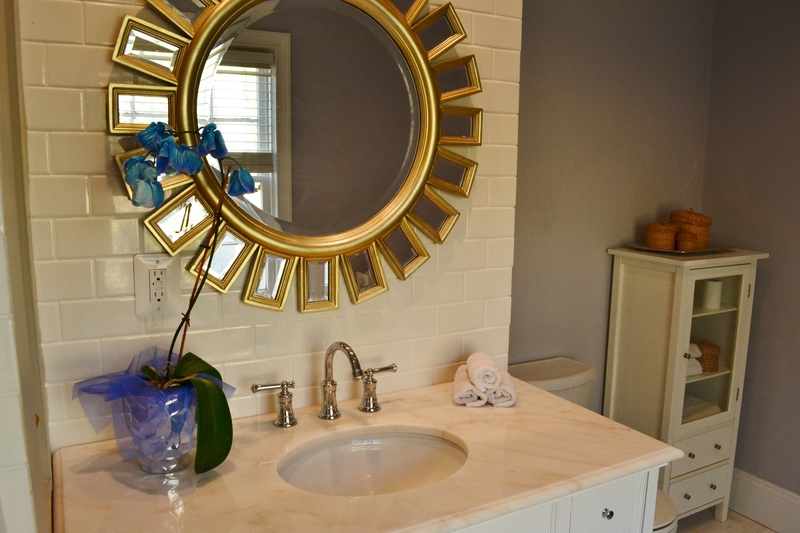 Furniture like vanity paired with classic marble. Perfect for a farm house renovation! Another view of a Sarah R. bath. 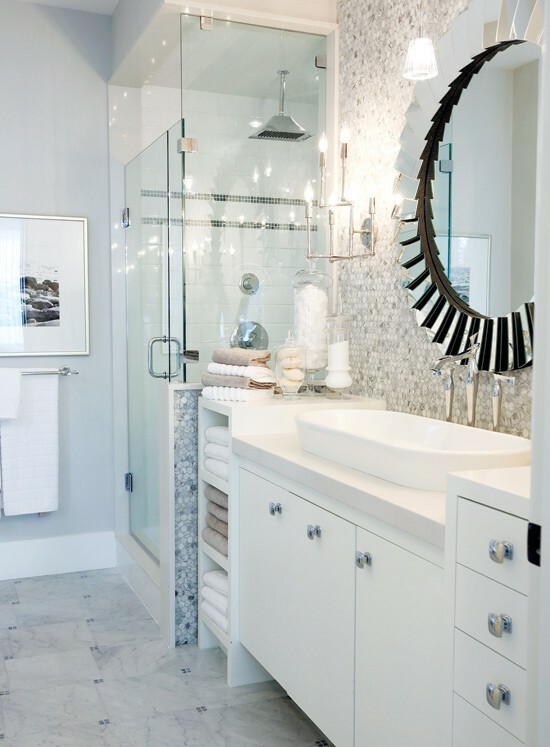 All the marble, white cabinetry and frameless shower. 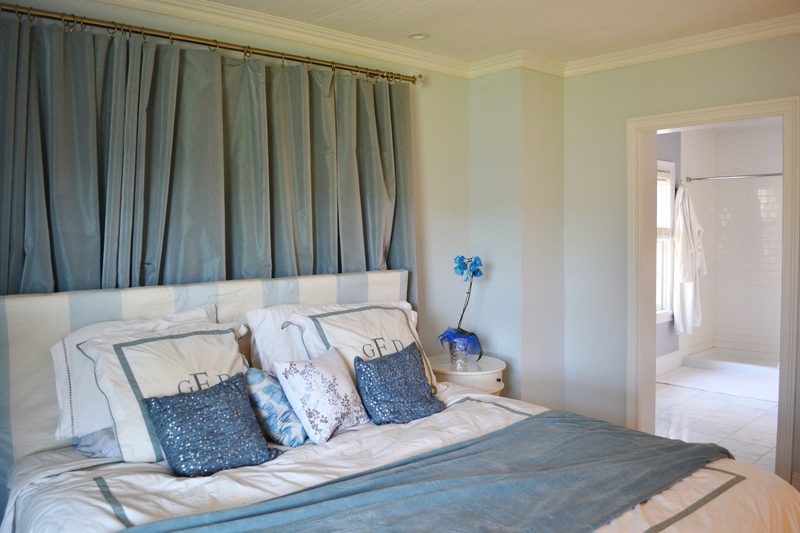 Love the blue and gray together. 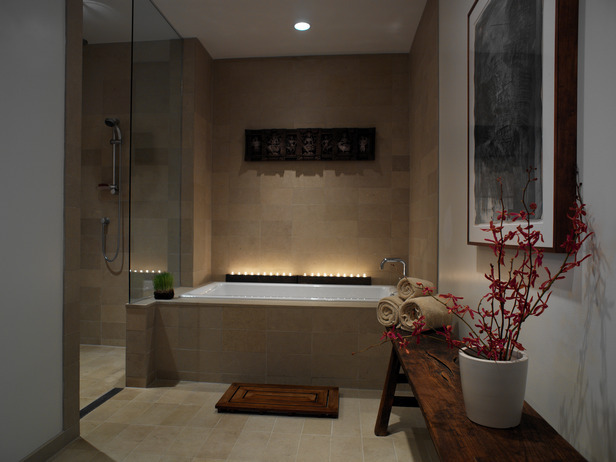 G installed the recessed lights and began adding more outlets to the bedroom and bathroom. Love, love, LOVE! Luxury on a budget! 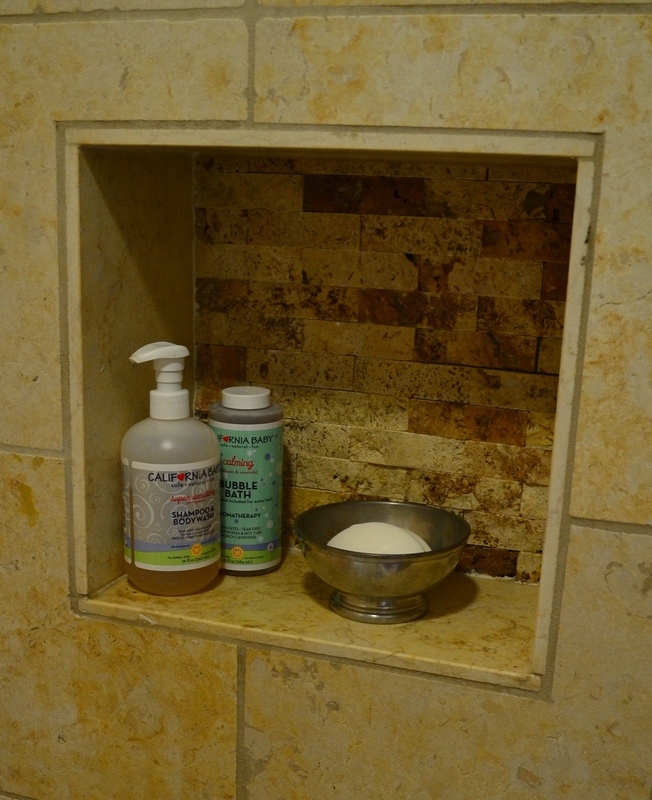 Weekend project of adding subway tile to the ceiling in shower stall and floor to ceiling behind the vanity ($1.76 sq ft.). 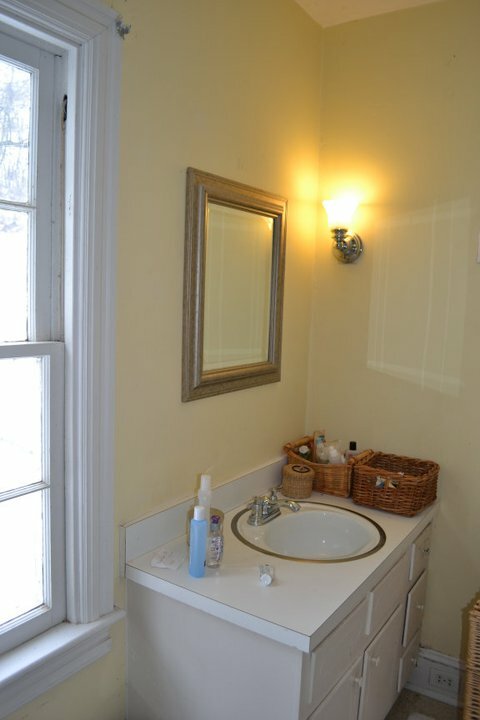 The vanity came with the marble top and the chrome fixtures were found at closeout prices. off to the right is the previous entrance to bath. I dreamed of the morning sunlight coming in from a window on the wall where the shower is located, but could not fit an east facing window into the budget . On the bright side, I found this sunburst mirror in one of my favorite online stores. I bought it when it went on sale, and it makes me smile every day. Now, I don’t even miss the morning sun! 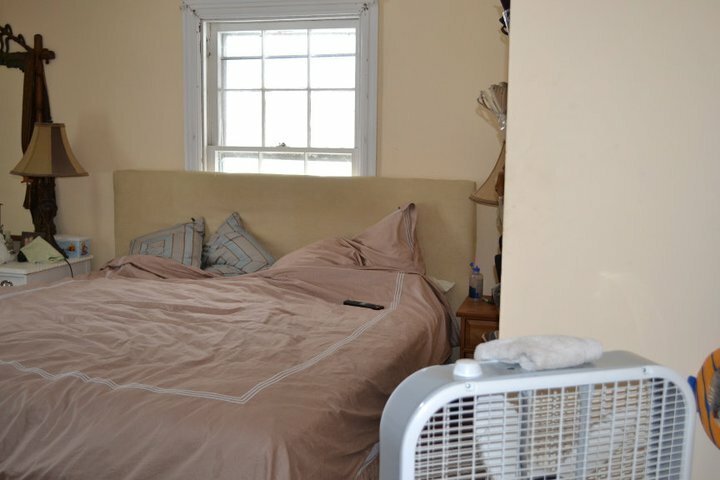 In the bedroom, the flooring was also in bad shape. We priced out hardwood and carpet for comparison. The nature girl in me searched for 100% wool carpeting on the cheap (the synthetic stuff can be toxic). After I received various rug samples from a company, we asked a local contractor to install the carpet we found online. 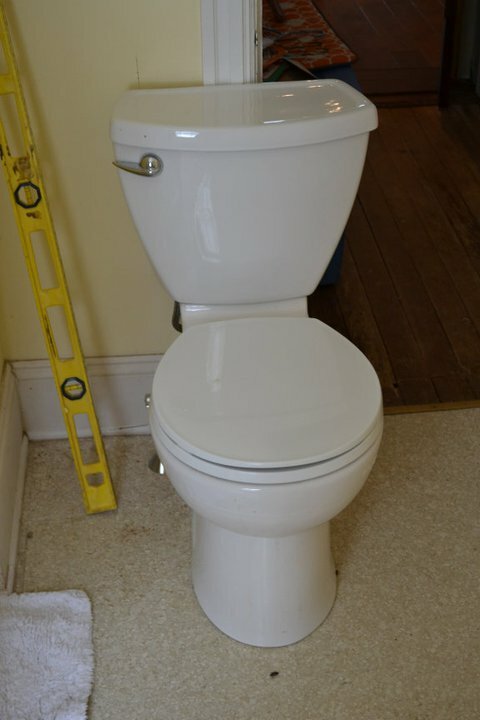 He was able to get an even better ‘contractor’s price’ and forwarded the savings on to us. The carpet and installation ended up being the same price as the closeout hardwood, only it would save us a ton of time because someone else is doing the work. We had to replace the ceiling in the bedroom and decided to use wainscoting (lighter than drywall) and it gave the room a cottage feel. G finished the room with crown molding. 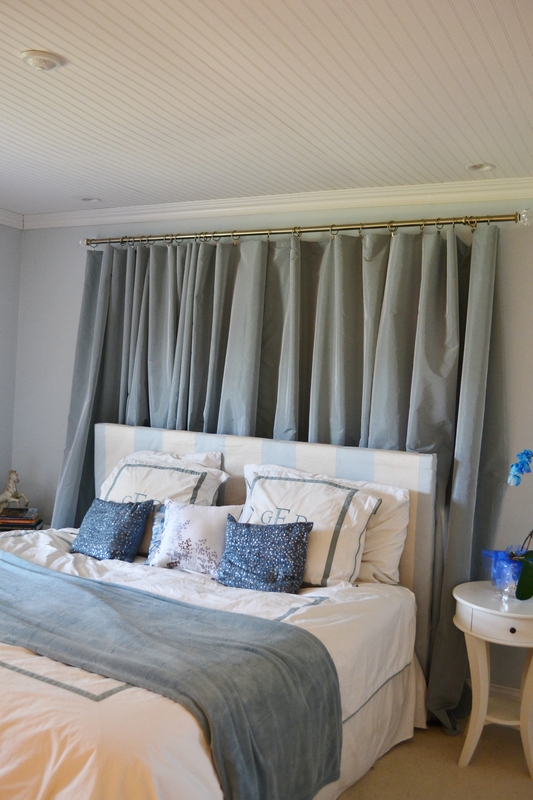 I found coordinating fabric in a NYC shop to reupholster our headboard and sew drapery to conceal an off centered window behind the bed. It is still a work in progress, but most of the work is behind us. 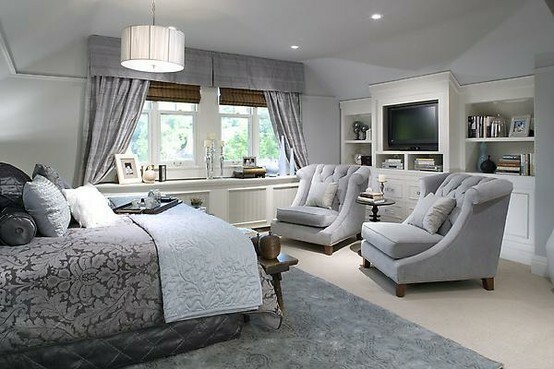 I hope this inspires you to update a room in your home and score a great deal of your own. If we can do it, you definitely can! The year before, we had an architect draw us plans for turning our 5 bedroom/ 1 bath into a 4 bedroom/2 bath with laundry area on the second floor. 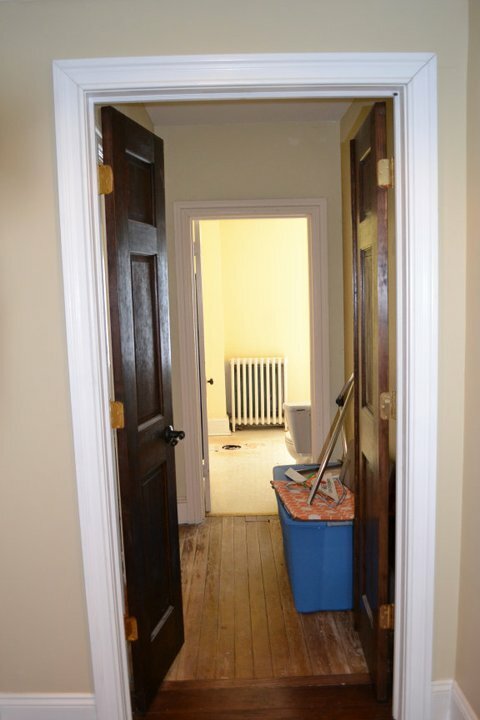 As we were gutting the upstairs bedroom for the nursery, we tackled the hallway, laundry area and new bathroom as well. 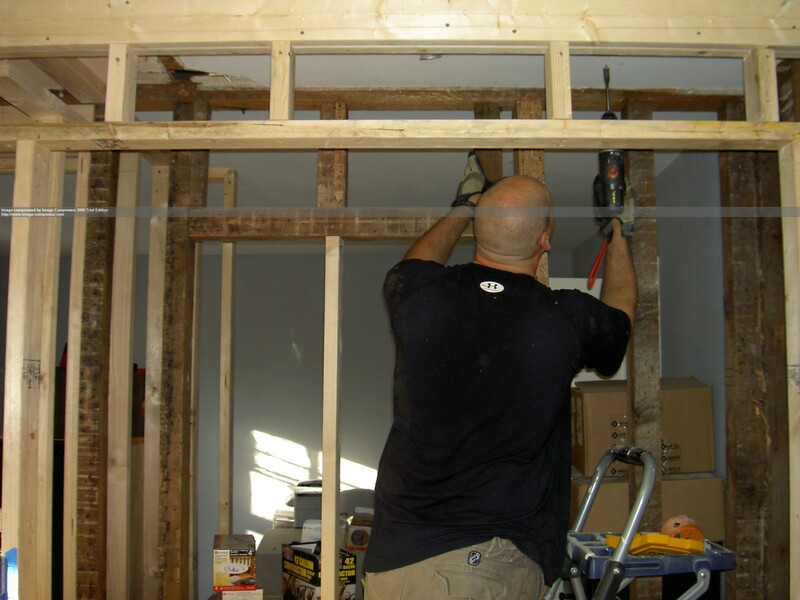 Gregg creating wall between laundry area and nursery. 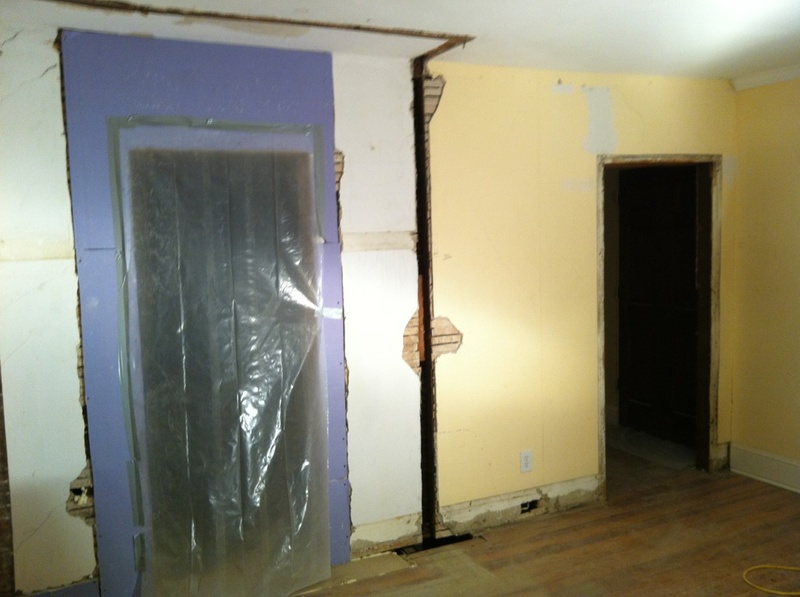 The wall between both rooms came down and we asked our friendly neighbor, Jerry, to install our plumbing. 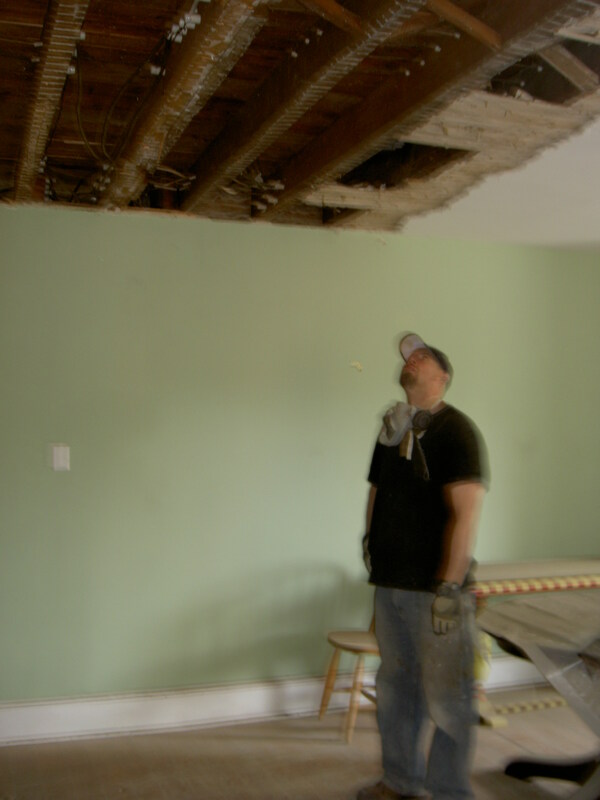 Jerry gently told Gregg and I that we had to remove the ceiling below to add the plumbing. It began to sink in that this job is bigger than originally planned. 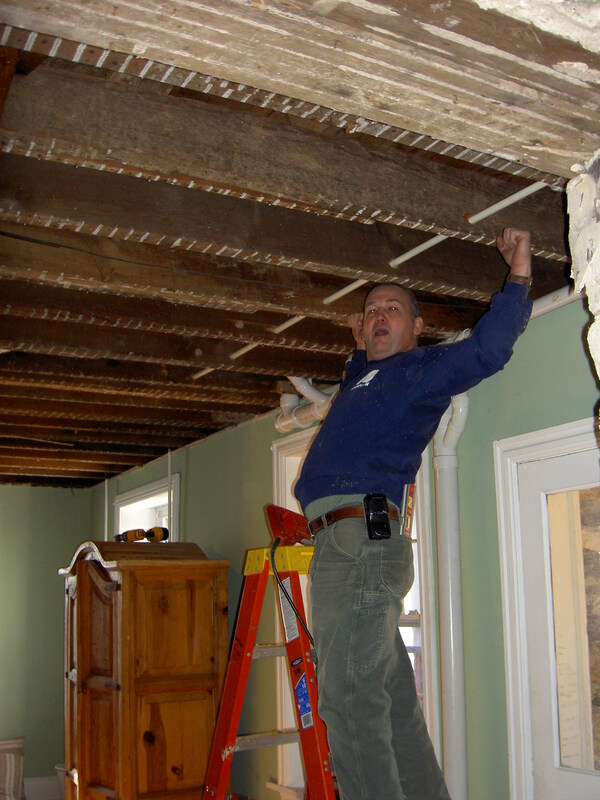 We pulled up our sleeves and began pulling down the ceiling as one hundred plus years of plaster, dust, walnut shells and squirrels’ nests fell onto our living room floor. 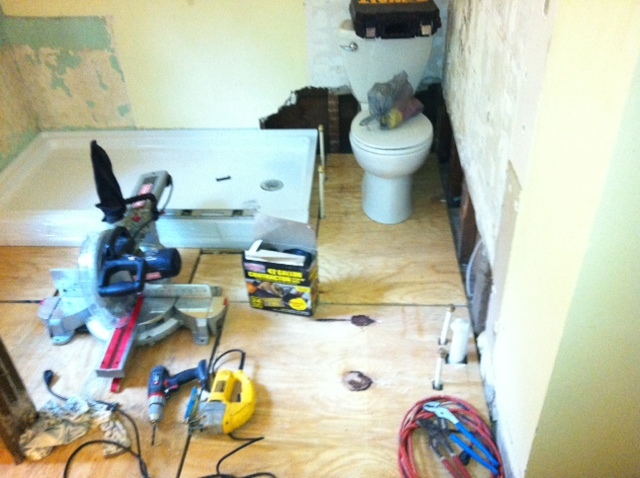 “Superman” Jerry plumbing the new bath. The stress of being 5 months prego while having both floors torn apart forced me to seek solace in idea websites 😉 Some of my inspiration baths are added below. 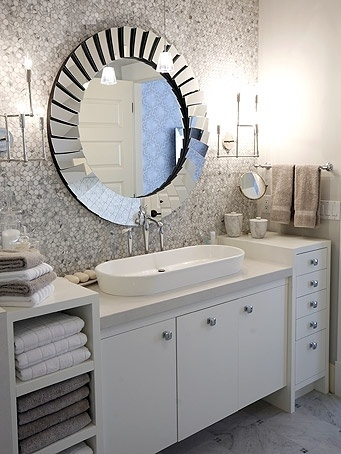 #1 Bath inspiration. 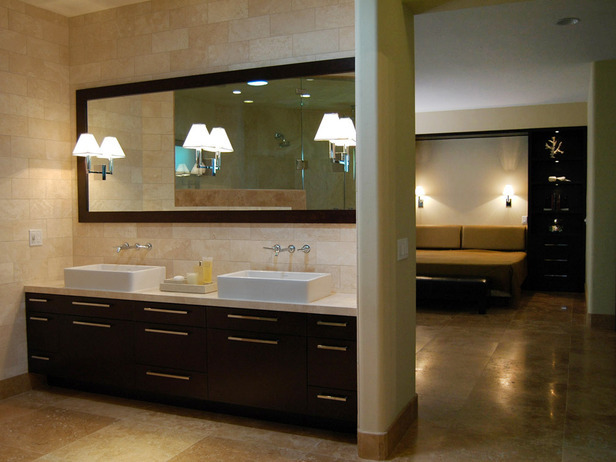 Wall of rustic stone, dark cabinetry, warm neutrals, wall mounted fixtures for vanity. 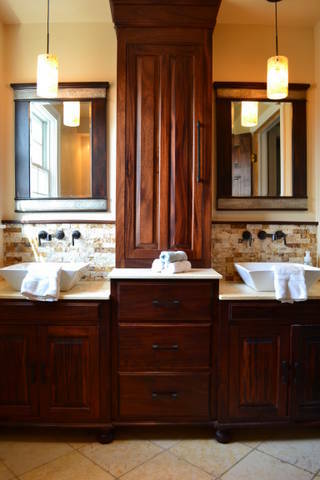 Love the counter top storage and wood with neutral limestone. I wanted an Italian/Mediterranean spa feeling- on a budget. As our roughed in dimensions were put together, I tracked down Gregg’s friends at Bell Stone in Chester for natural stone ideas on the cheap. After a thorough search of their warehouse, we stumbled upon a small lot of beautiful Jerusalem Gold tumbled marble tiles. Because it was the last of a larger lot, we got them for less than if they were a new shipment (stone colors vary with each shipment). I found rustic marble sheets in their showroom and purchased just enough to incorporate a natural edge stone for the backsplash. 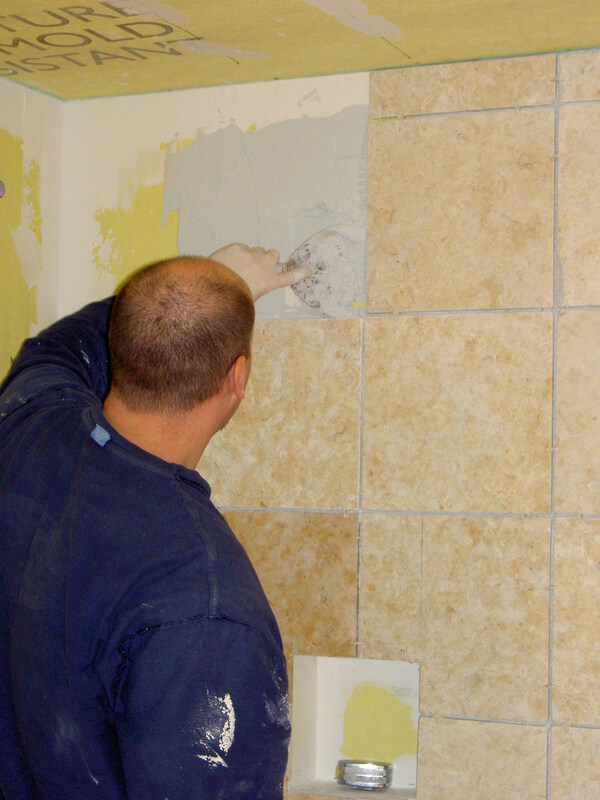 Gregg’s first tile job. Radiant heating under tiles. With the marble shopping done, I had enough room to spend a little extra for custom cabinetry. Our friend and neighbor, Tim at Flegel Woodcraft, is passionate about woodworking and brings his appreciation for fine craftsmanship to every aspect of his furniture. We are both self-proclaimed ‘design geeks’ and I had so much fun working with him. 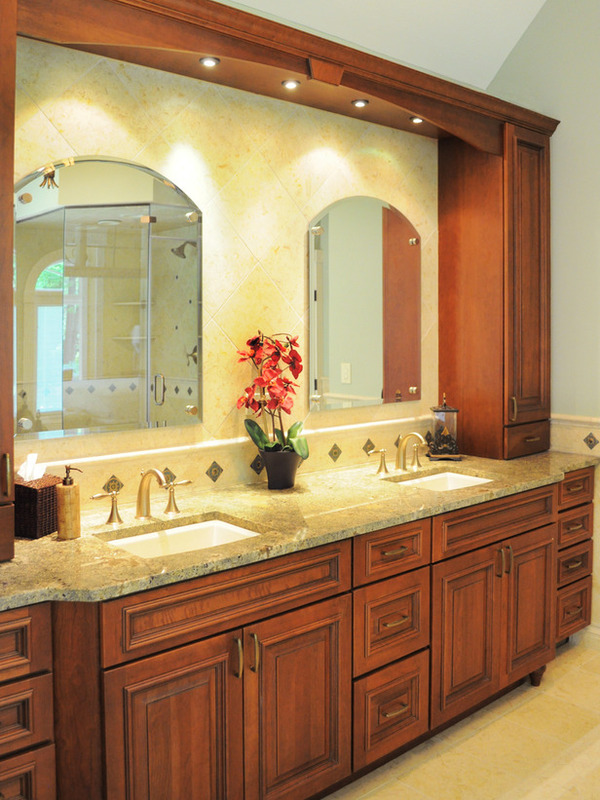 We settled on a classic mahogany style that offered a double vanity and plenty of storage. 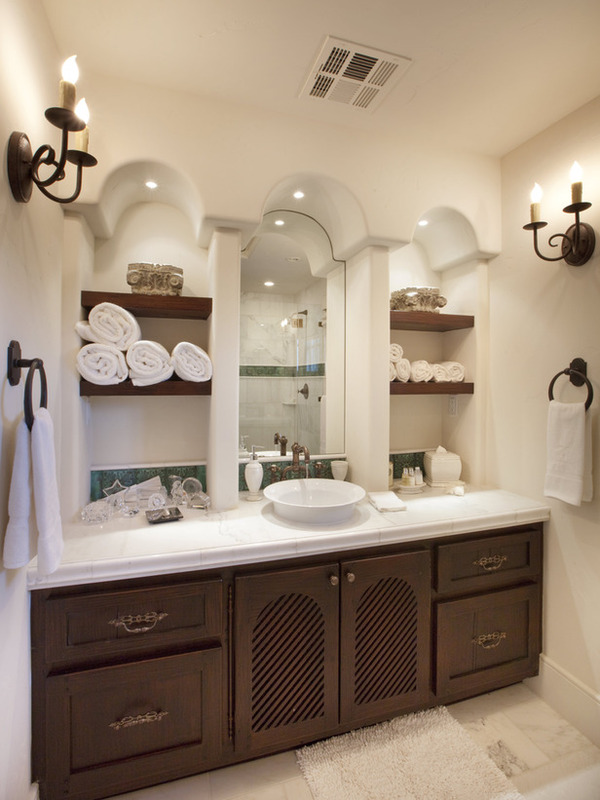 After he sent me dimensions, I started my search in local stone yards to top the vanity. We removed the radiator and decided on radiant floor heating. You can order it online -just plug in the dimensions and the company will send it to you with installation instructions. 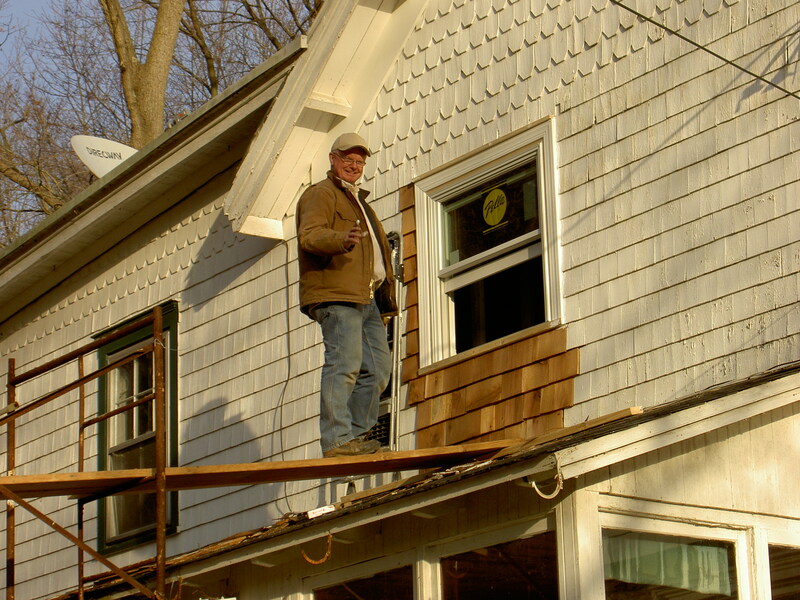 Dad replacing cedar siding after installing the counter height window. 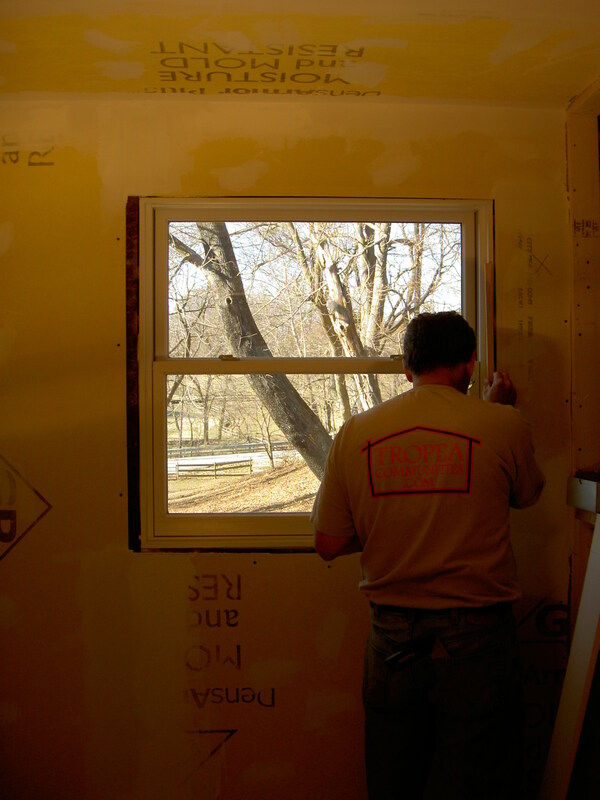 We had to remove the large window and replace it with a more efficient window to fit over the new vanity. 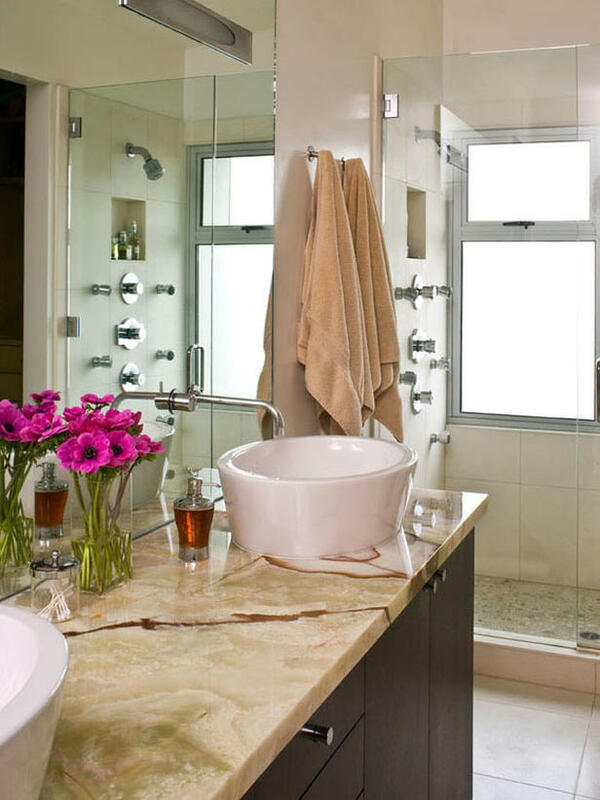 I found the vessel sinks and wall mounted fixtures on a discounted online store. The hardware was found at RH outlet store at closeout. It took a few trips to get all the hardware for the vanity because they only stock return items, but they have excellent prices. 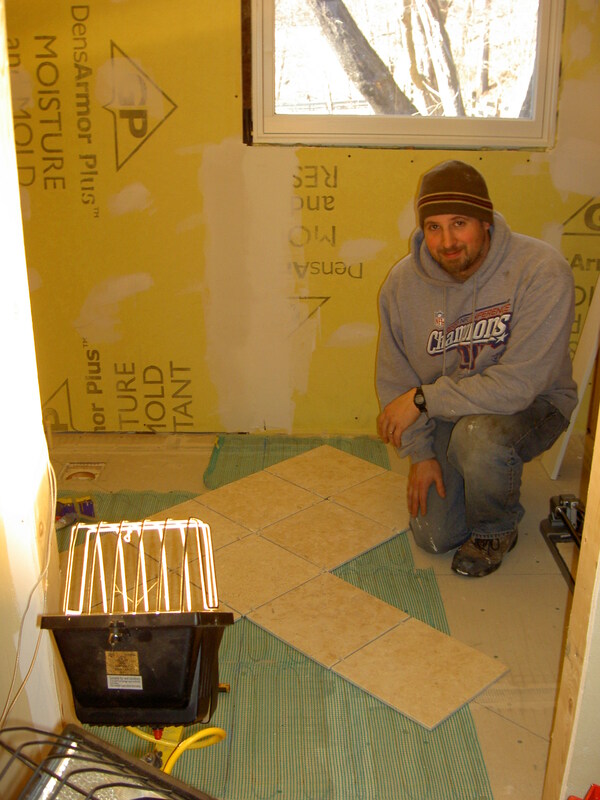 It was so cold outside, the wet saw would freeze between cuts, so Greg and Gregg cut tiles in our other bathroom.